Does anyone remember one of facebook’s hallmark features: the facebook group? I know this app is a thing of the past, but it’s worth mentioning for a couple of reasons. In his publication on groupware and social dynamics in 1994, Jonathan Grudin argues that there are eight major challenges that developers of technology applications seeking to create better virtual spaces for collaboration must overcome. Since 1994 developers have to a large extent overcome many of these challenges. And while there still remain many problems with virtual groupware, technology and groupware development have improved tremendously. No where is this better seen than in Facebook’s old groups feature. Facebook groups addressed the problems of critical mass and the prisoner’s dilemma, disparity in work and benefit and unobtrusive accessibility. However, at the time Facebook still needed to improve on exception handling. I will be using the “No Cornellian in Poverty” group that was formed several years a year ago as a running example to illustrate these concepts. 1) Critical mass and the Prisoner’s Dilemma: According to Grudin, one of the biggest issues with groupware is that it does not always enlist the critical mass of users required to be useful to the individual user. Facebook groups addressed this problem by creating a social setting online where a user’s existing social network is mapped out online. Currently there are more than 700 million users on facebook using the site on a consistent basis to interact with people who are important to them. Especially in younger generations, many users have accepted a vast majority of their friends as “facebook friends.” So when it comes time to form a group, whether it be for a cause like the group used in this blog, or about anything else the existing critical mass is already there to form the group. 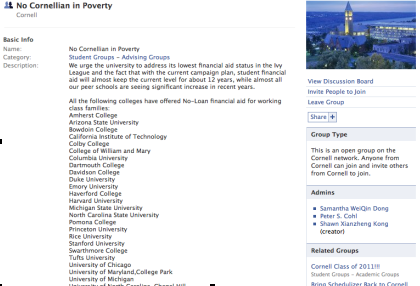 “No Cornellian in Poverty” had over 450 members in the group from an admin list of 3 people—and this was well over a year after the group was formed. Clearly facebook groups had tremendous success at acquiring critical mass. 2) Disparity in Work and Benefit: Another one of Grudin’s concerns with groupware applications is that they often require additional work from individuals who do not perceive a direct benefit from the work that they put in. The Facebook Groups application overcame this challenge by making it really easy to set up a Facebook group. Utilizing drop down menus, auto-fill features, radio buttons and text boxes, users of the Facebook group application could set up their group in a matter of minutes and then invite all their friends to join. The small amount of work is definitely worth the reward of garnering attention to or facilitating discussion about the Facebook group. 3) Unobtrusive Accessibility: In his paper, Grudin states that groupware ought to ensure that features that support group processes are used relatively infrequently in comparison to more heavily used features. The beauty of facebook is that it gives individual users control over the quantity and nature of information they receive via email from the group. For example, some users may find the “discussion board” useful whereas others may find the “links” useful. In either case, a user can go into the group’s settings and customize the type and quantity of emails he or she receives from the group. This allows for the application to be less obtrusive. Nevertheless Facebook groups made a number of important strides towards overcoming Grudin’s challenges for developers. Despite having difficulty with handling exceptions, it obtained the necessary critical mass, eliminated the disparity between work and benefit and made accessibility far less obtrusive. This progress seems to suggest that slowly groupware will eliminate all the challenges that Grudin presents, making virtual collaboration as efficient and beneficial as face-to-face interaction. Yet we ought to be a little more reserved in our optimism. After all there seems to be an inherent and irreplaceable value to personal interaction. Are we then chasing an illusive goal or trying to conquer the unconquerable? It seems that only time will tell that tale.